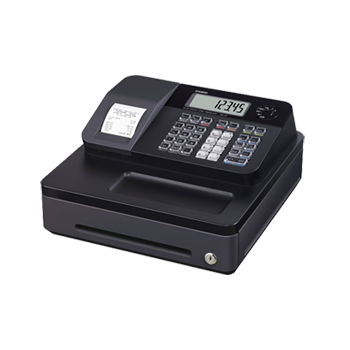 Casio SE-G1 A Grade catalogue return cash register. These A grade cash registers are all as new, but have been returned as the customer decided not to keep them. The tills are fully working and supplied with manuals and keys, but no spool (if you need a spool you can add 1 from the drop down below, but if you are issuing receipts with every sale then you don't need the spool). Supplied in original boxes, but may have bubble wrap instead of the original packaging. The SE-G1 can't run without paper so don't forget to order at least 1 box of till rolls or you can have 3 boxes for £30 with no additional delivery charge (see drop downs below). Please note that this is a very basic, light duty cash register. The printer cannot be switched off so you should allow extra funds for all the till rolls you will use. You can choose to use in either receipt or journal mode, but the printer will always print. Make sure to order plenty of till rolls - take advantage of our amazing till roll deals before checking out. Casio SE-G1 here also only has a small cash drawer. If you need a full size drawer or a printer that can be switched off please view the Casio SE-S10, the Casio SE-S100, or the Casio SE-S400. The Casio SE-S100 is the latest model with 12 programmable departments and SD card compatibility. Please note that we cannot accept returns on any products in our catalogue returns section including this one. Order a brand new Casio SE-G1 here.